Atheneum Books for Young Readers, 9781534408944, 40pp. In the tradition of School’s First Day of School, debut author Keith Calabrese and Pura Belpré Award winner Juana Medina share a sweet, universal story about a clever little girl whose shoes are nervous about the first day of school. Lena doesn’t want to miss out on her first day of school, but she can’t go without her favorite shoes! How can she convince them to be brave? Keith Calabrese lives in Los Angeles with his wife, kids, and a dog who thinks he’s a mountain goat. 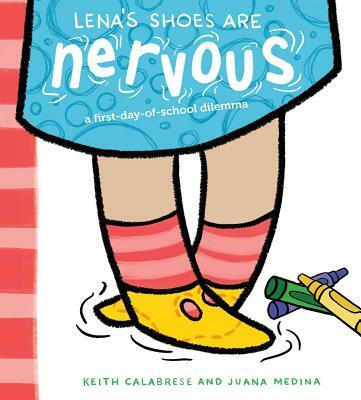 Lena’s Shoes Are Nervous is his first children’s book. Juana Medina was born and raised in Bogotá, Colombia, and came to the US to study at the Rhode Island School of Design (RISD). She now lives in Washington, DC, where she teaches at the Corcoran College of Art. Visit her at JuanaMedina.com. * "This clever story confronts kindergarten jitters in a unique way... The brief, humorous text includes clever dialogue between Lena and her supportive father throughout. By casting the shoes as the nervous ones, Calabrese allows Lena to embrace her excitement, yet confront her concerns about the new experience. Her father encourages her to solve her own problem, empowering Lena while acknowledging her fears. Medina’s digitally rendered, childlike illustrations fit the story perfectly... VERDICT: This innovative first day of school story will be a welcome addition to libraries everywhere." "Lena is pumped to start kindergarten, but she may have to call the whole thing off. As she explains to Dad, her shoes, which are essential to her first day ensemble, are having serious second thoughts.... Medina (ABC Pasta) employs digital cartooning, a mix of fluid ink lines and flat, bright colors, to supply a steady flow of visual energy. Making his debut, talent-to-watch Calabrese brings flawless comic timing and a fresh twist to the back-to-school theme." "Young Lena is totally prepared, and excited to start kindergarten. She's not nervous...but her shoes are... The story perfectly displays humorous kid-logic... This isn't one of those first-day-jitters stories where a grownup steps in (pun intended) to solve the problem. Lena is in control throughout, as Medina's judiciously colorful, child-friendly (and inclusive) digital illustrations show." "“Today, Lena starts kindergarten. Lena is very excited”; unfortunately, Lena’s favorite shoes are too nervous to go.... The elliptical approach to anxiety is funny and effective, with the book treating Lena’s projection cheerfully but respectfully as the process allows her to explore her own worries without losing her pose of competence; along the way, her father is a loving helper who gives her space. There’s playful dash to the digital art, with thick, scrawly lines and entertaining details (watch the cat) providing a robust and easygoing partner for the text. Nervousness isn’t limited to school, so this may provide kids with all kinds of apprehension a stylish way to explore their feelings."